Professor Lu received dual B.S. degrees in Physics and Electrical Engineering in 1992 at Washington University in St. Louis. After studying in Professor Michael Tinkham's research group at Harvard University on superconducting single-electron transistors, she received her Ph.D in 1997. She subsequently conducted her postdoctoral research on the electron transport of individual carbon nanotubes at UC Berkeley under the University of California President's Postdoctoral Fellowship. 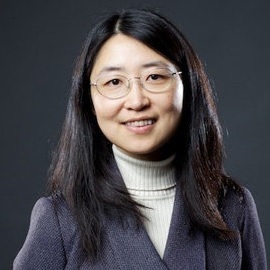 The research of Professor Lu focuses on the investigation of metals and semiconductors whose size is reduced to the nanoscale (less than 1/1000 of the width of a human hair). Her research activities include the fabrication of nanostructures using both lithography and self-assembly techniques; characterization of their electrical, optical, magnetic, and topological properties; and development of nanoscale systems with enhanced functionality. In particular, she is interested in the quantum states and dynamics of electron charge and electron spin which will be essential for future applications in high density, low power and ultra fast electronics. This includes but not limited to memory and logic circuits, chemical/biological sensors, optoelectronic devices, spintronic devices, and energy harnessing devices. 2005 Maseeh Best Faculty Research Award in 2005.